Today we learned how to say “I’m sorry” and “excuse me” in Japanese! In this review, we will show you some variations on these phrases as well as some other ways you can use them. ★　A more casual way to say it is gomen. Some variations are gomen ne or gomen yo. 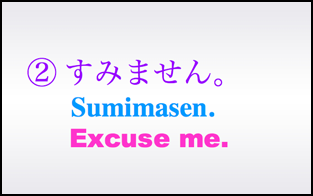 ★　Sumimasen is just like “excuse me” in that it can be used either as an apology or to get someone’s attention. It can also be used as thanks for receiving a gift. 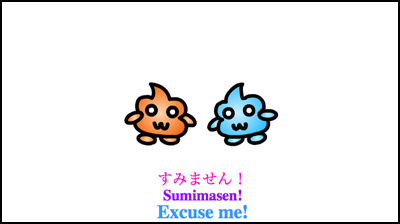 ★　Sumimasen deshita – the past tense of sumimasen. This is another way to apologize for something that you did. 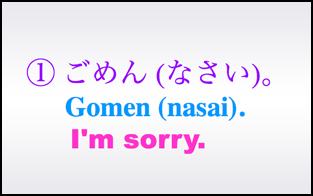 ★　Mōshiwake arimasen – A very formal expression of apology, showing stronger feeling than sumimasen. It is usually used when talking to your superiors. There are many ways to apologize in Japanese. Depending on the situation, some are more appropriate than others. Japanese people often bow when they apologize. The more serious the apology, the lower they bow. 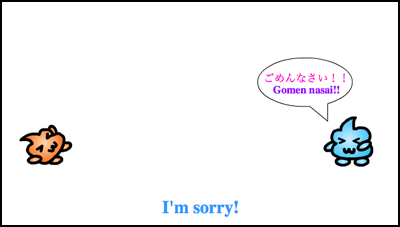 For casual apologies like gomen a bow is often not needed. If you bump into somebody, sumimasen and a small bow will be polite enough. If you mess up badly at work, you should use mōshiwake arimasen and be prepared to bow down low to your boss. The more of these phrases you remember, the better equipped you will be to apologize in any situation.